Arctic Book Review – founded by Russell A. Potter and welcoming submissions from readers, artists, and professors interested in the North, the Arctic Book Review was founded in 1999 as a bi-annual (Spring and Fall) review of books on subjects related to the Arctic. Although our initial reviews have been mostly of books relating to the Eastern Canadian Arctic and Greenland, we would welcome reviews of books from or relating to all circumpolar nations and peoples. We welcome submissions or proposals of reviews; these should ideally be in electronic form, and can be submitted via e-mail or as html documents. July 29, 2009: “Polar Hays: the Life and Contributions of Isaac Israel Hayes, M.D.” (by Douglas W. Wamsley). June 06, 2009: “Franklin: Tragic Hero of Polar Navigation” (by Andrew Lambert). 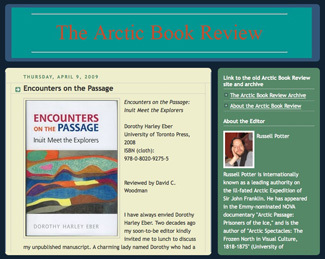 April 09, 2009: “Encounters on the Passage: Inuit Meet the Explorers” (by Dorothy Harley Eber).